"After much study, he was able to know THE FORCE, and it communicated with him. He came to see things in a new way. His 'aura' and powers grew very strong. The Skywalker brought a new life to the people of his system, and became one of the founders of the Republic Galactica. "THE FORCE has two halves: Ashla, the good, and Bogan, the paraforce - the dark or evil side. Fortunately, Skywalker came to know the good half and was able to resist the paraforce; but he realized that if he taught others the way of the Ashla, some, with less strength, might come to know Bogan, the dark side, and bring unthinkable suffering to the Universe. "For this reason, the Skywalker entrusted the secret of THE FORCE only to his twelve children, and they in turn passed on the knowledge only to their children, who became known as the Jedi Bendu of the Ashla: 'the servants of the force.' For thousands of years, they brought peace and justice to the galaxy. At one time there were several hundred Jedi families, but now there are only two or three. "For as the Republic spread throughout the galaxy, encompassing over a million worlds, the GREAT SENATE grew to such overwhelming proportions that it no longer responded to the needs of its citizens. After a series of assassinations and elaborately rigged elections, the Great Senate became secretly controlled by the Power and Transport guilds. When the Jedi discovered the conspiracy and attempted to purge the Senate, they were denounced as traitors. 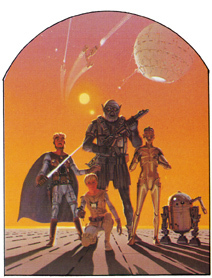 Several Jedi allowed themselves to be tried and executed, but most of them fled into the Outland systems and tried to tell people of the conspiracy. "The Jedi were unable to avert this catastrophe because a terrible thing had happened: During one of his lessons, a young PADAWAN-JEDI, a boy named Darklighter, came to know the evil half of the force, and fell victim to the spell of the dreaded Bogan. He ran away from his instructor and taught the evil ways of the Bogan Force to a clan of Sith pirates, who then spread untold misery throughout the systems. They became the personal bodyguards of the Emperor. "The Jedi were hunted down by these deadly Sith knights. With every Jedi death, contact with the Ashla grows weaker, and the force of the Bogan grows more powerful.